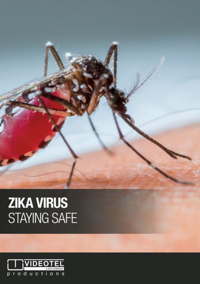 "Zika Virus – Staying Safe," produced by Videotel, a maritime e-Learning leader, explains the dangers of the virus and how to help prevent its spread. KVH Industries, Inc., (Nasdaq: KVHI), announced on July 27, 2016 that it is offering Videotel's new safety and training video about the Zika virus free to all mariners worldwide. The goal of the program is to increase awareness of the vitally important prevention measures that can keep seafarers and their colleagues and families safe. The World Health Organization (WHO) declared the Zika virus a public health emergency earlier this year. Given the global nature of the maritime industry, it is imperative that seafarers take precautions to prevent further spread of the disease. The prevalence of the Zika virus in such areas as Brazil has heightened concerns with the approaching Olympic Games in Rio de Janeiro next month. "Zika Virus – Staying Safe" is a 13-minute training video produced by VideotelTM, a KVH company, with input from the International Maritime Health Association (IMHA) and a panel of medical and subject-matter experts. KVH has created a dedicated website for downloading the free Zika safety video and an accompanying workbook. In addition, KVH multicast the training video to its IP-MobileCastTM customers on vessels across the globe, who will automatically receive the video for immediate viewing onboard. To spread the word quickly, the program includes emails targeted to a broad audience and a coordinated social media campaign. "We are hopeful that our training program and distribution efforts will get this important information to the maritime industry swiftly and thereby help protect seafarers and prevent the spread of the disease," says Martin Kits van Heyningen, KVH chief executive officer. The video includes information about the nature of the Zika virus, how to avoid becoming infected, and the role of a pest management plan on vessels to avoid passive transportation of virus-infected mosquitoes on ships. "Knowing the answers to simple questions such as what color clothing to wear to minimize chances of mosquito bites or what time of day the insects are most active can be hugely beneficial to mariners," says Nigel Cleave, Videotel chief executive officer. KVH is being aided in its video distribution efforts by seafarer agencies, including the International Seafarers' Welfare and Assistance Network (ISWAN). "We are happy to help promote this initiative to the 430 seafarer centers around the world, and also share this information via our many social media channels," says Roger Harris, executive director of ISWAN. You can find the video (you have to register first) and further information here. Download the Zika virus handbook.